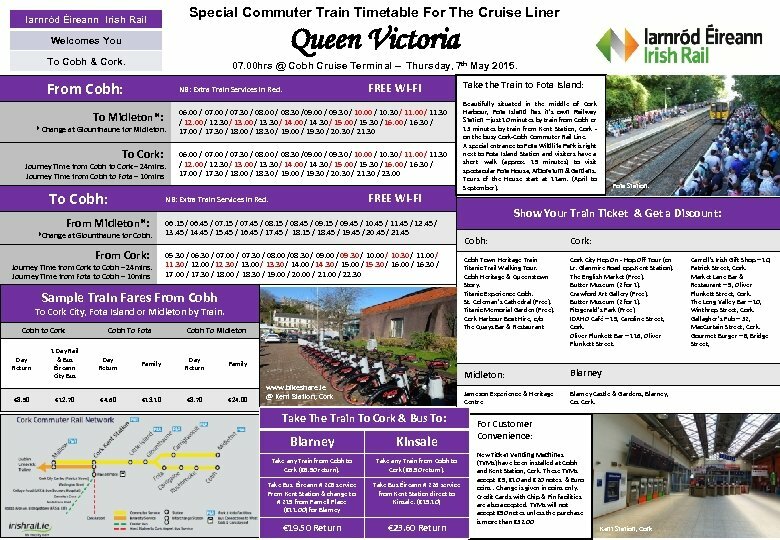 Cork Commuter Rail Network For Passengers off The Cruise Liner Queen Victoria @ Cobh Cruise Terminal, Thursday, 7 th May 2015. Visit Cork City Map – Courtesy of Fáilte Ireland ©. Fota House & Gardens, Fota Wildlife Park, Midleton, Cork City, Blarney or Kinsale. By Train v Kent Station, Cork: Headquarters of Iarnród Éireann – Irish Rail in Cork. The present Kent Station was built in 1893 and was the location for the making of the movie “The Great Train Robbery” in 1978 - starring Sean Connery, Donald Sutherland Leslie-Anne Down. The oldest Post Box in Ireland is also located in Kent Station’s main concourse. Visit the unique collection of World Railway Plaques in the Travel Centre on platform 4 and see Locomotive # 36, dating from 1847 on permanent display in Kent Station since 1950. Cobh Railway Station: Located next to Cobh’s Cruise Terminal and The Queenstown Story & Cobh Heritage Centre, where over 50 Cruise Liners are scheduled to visit Cobh in 2015. Frequent Bus Éireann Bus Service from Kent Station (Route # 205) departs every 15 minutes for Cork City Centre – and also serves Parnell Place Bus Station, St. Patrick’s Street (City Centre), Washington Street, College Road (UCC & Bon Secours Hospital), Dennehy’s Cross, Model Farm Road (Cork University Hospital) and Bishopstown (CIT). Take a Bus Éireann bus from Kent Station , Cork to: (1) Cork City Centre (Route # 205) (2) Blarney & Blarney Castle (via Route # 205 & Route # 215) (3) St. Finbarre’s Cathedral , U. C. C. & Cork University Hospital (Route # 205) (4) Kinsale (Route # 226 direct from Kent Station, Cork). (5) Cork Airport (Route # 226 & # 226 A direct from Kent Station, Cork). The Cork-Cobh Railway Line opened in March 1862 – and celebrated it’s 150 th Anniversary in March 2012. Thank you for travelling with Iarnród Éireann Irish Rail. 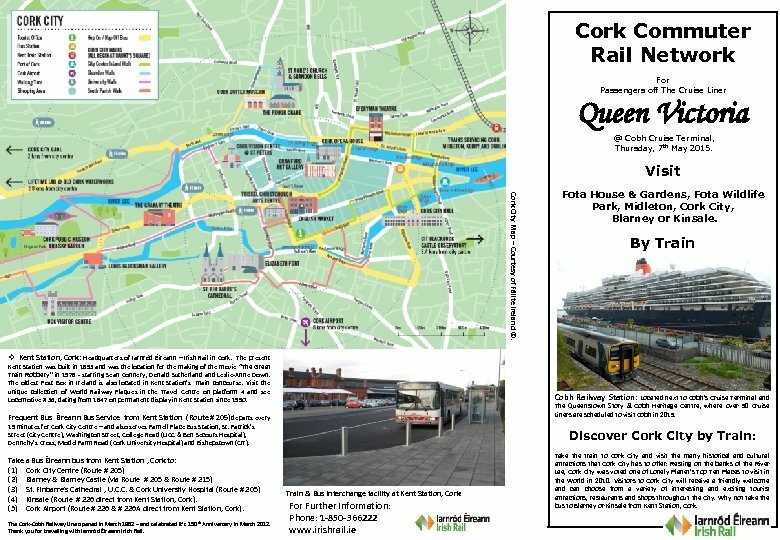 Discover Cork City by Train: Train & Bus Interchange facility at Kent Station, Cork: For Further Information: Phone: 1 -850 -366222 www. irishrail. ie Take the train to Cork City and visit the many historical and cultural attractions that Cork City has to offer. Resting on the banks of the River Lee, Cork City was voted one of Lonely Planet’s Top Ten Places to visit in the World in 2010. Visitors to Cork City will receive a friendly welcome and can choose from a variety of interesting and exciting tourist attractions, restaurants and shops throughout the City. Why not take the bus to Blarney or Kinsale from Kent Station, Cork.